Dr. Michael R. Schwartz discusses the unique benefits of JUVÉDERM VOLUMA™ XC, the only injectable treatment of its kind to be FDA-approved for volume enhancement in the midfacial region. 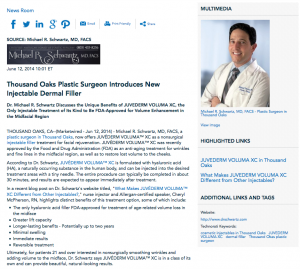 Thousand Oaks, CA — Michael R. Schwartz, MD, FACS, a plastic surgeon in Thousand Oaks, now offers JUVÉDERM VOLUMA™ XC as a nonsurgical injectable filler treatment for facial rejuvenation. JUVÉDERM VOLUMA™ XC was recently approved by the Food and Drug Administration (FDA) as an anti-aging treatment for wrinkles and fine lines in the midfacial region, as well as to restore lost volume to the cheeks. According to Dr. Schwartz, JUVÉDERM VOLUMA™ XC is formulated with hyaluronic acid (HA), a naturally occurring substance in the human body, and can be injected into the desired treatment areas with a tiny needle. The entire procedure can typically be completed in about 30 minutes, and results are expected to appear immediately after treatment. Ultimately, for patients 21 and over interested in nonsurgically smoothing wrinkles and adding volume to the midface, Dr. Schwartz says JUVÉDERM VOLUMA™ XC is in a class of its own and can provide beautiful, natural-looking results. Dr. Schwartz, a double board-certified plastic surgeon, earned his medical degree from Baylor College of Medicine. After completing his general surgery residency training at the University of Southern California, he went on to the University of Texas Southwestern Medical Center to complete his residency in plastic and reconstructive surgery. Dr. Schwartz lectures nationally and is a national instructor for both Sientra and Mentor Corporations. He is a Fellow of the American College of Surgeons and a member of several respected professional organizations, including the American Society of Plastic Surgeons and the American Society for Aesthetic Plastic Surgery. Dr. Schwartz is available for interview upon request. To learn more about Dr. Schwartz and his practice, please visit drschwartz.com or facebook.com/drmschwartz.